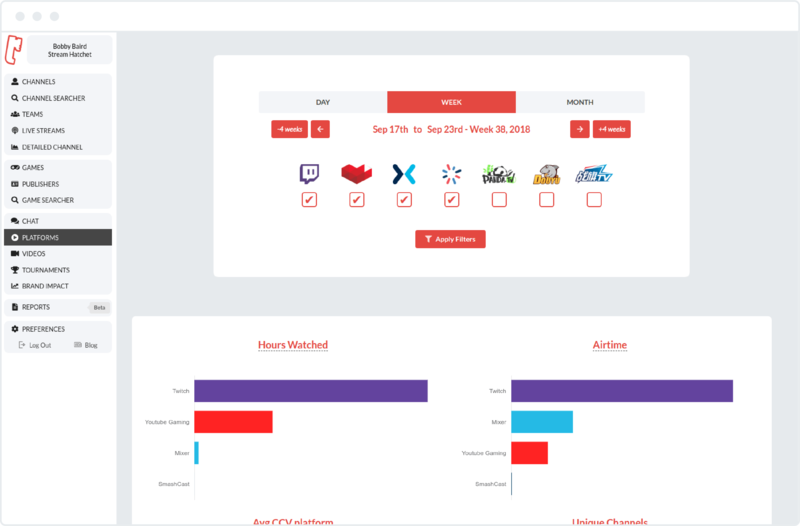 Channels, games, publishers, tournaments, teams, reports, brand impact, chat analytics. Cutting edge insights. 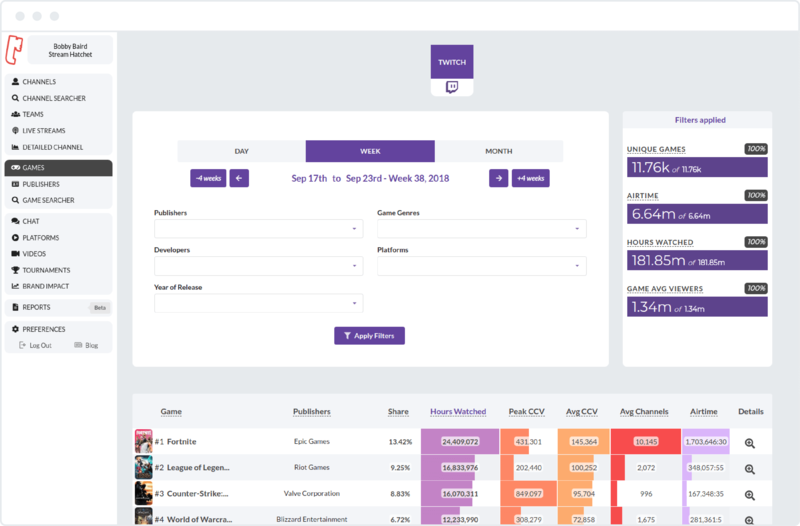 Track all the data, and get the insights you are looking for in the world of esports game streaming. 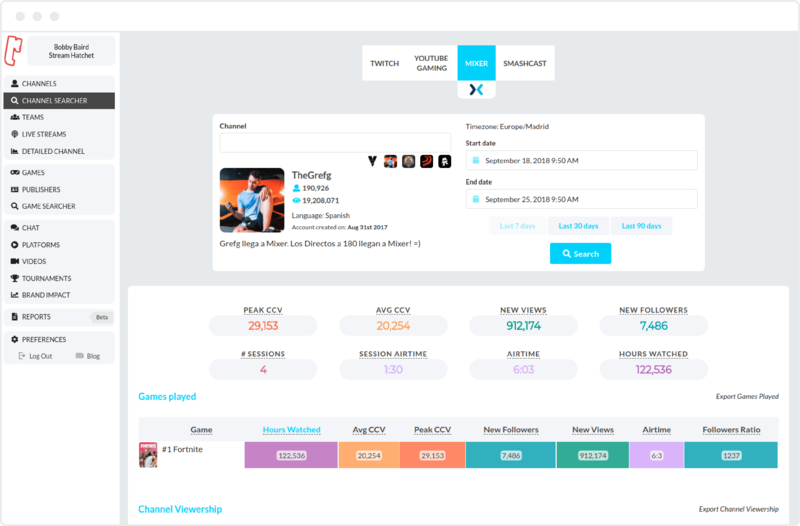 Find the channels you're looking for! 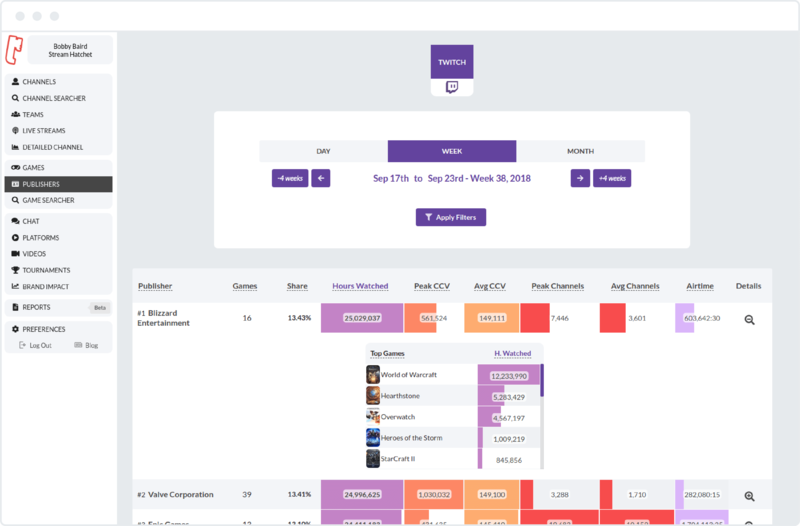 Get lists of channels by games played, languages, followers, mature content and other criteria across multiple platforms. 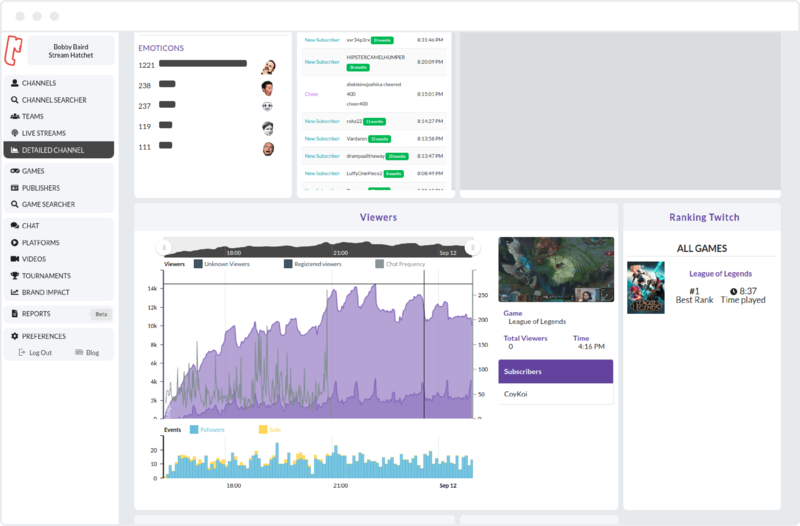 Access two years of historical game streaming intelligence in Twitch. 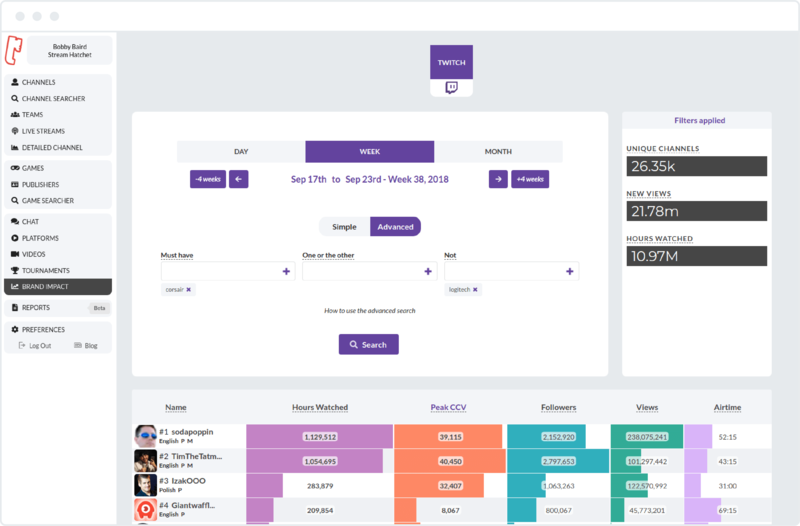 Analyze viewership and engagement over time, monitor the streaming behavior of the channel and further features. 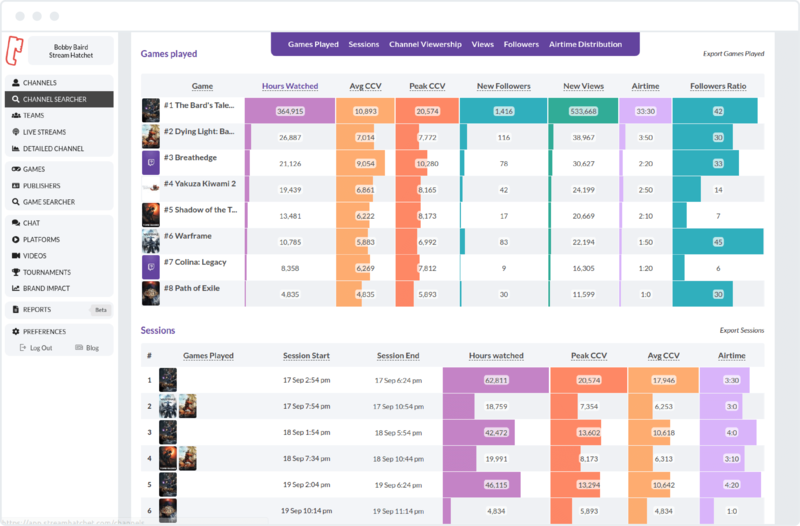 Discover the games played, the channel sessions and analyze the info by different provided metrics. 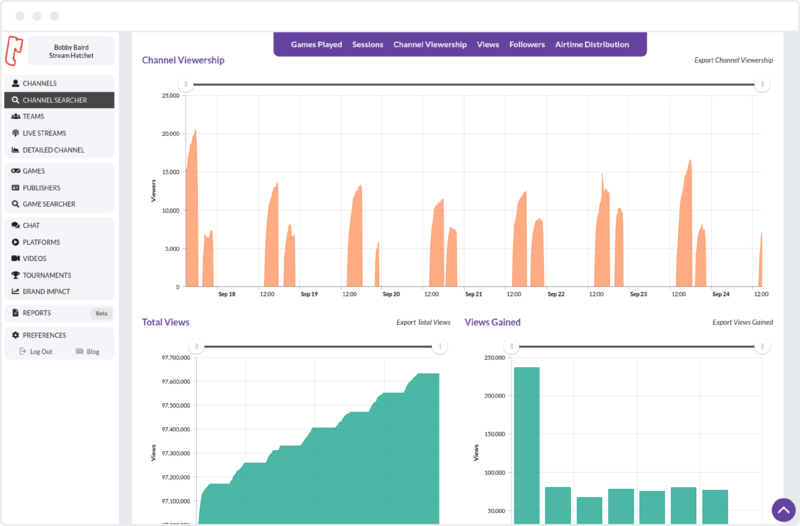 You can evaluate the channel viewership, airtime distribution, views, followers, and comprehend the evolution over time. Track the data of any past session and get all the information you're looking for. 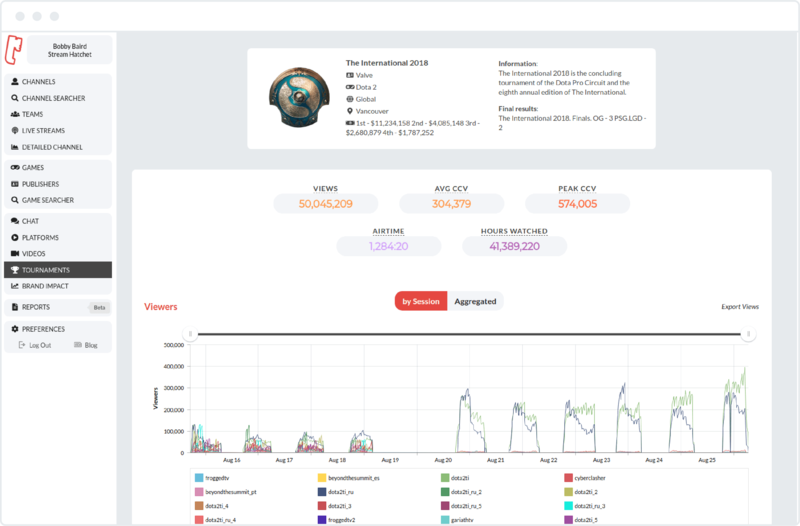 Analyze viewership data in real time and past sessions: followers gained and lost, registered viewership, chat engagement, top topics and emoticons, log activity and more. 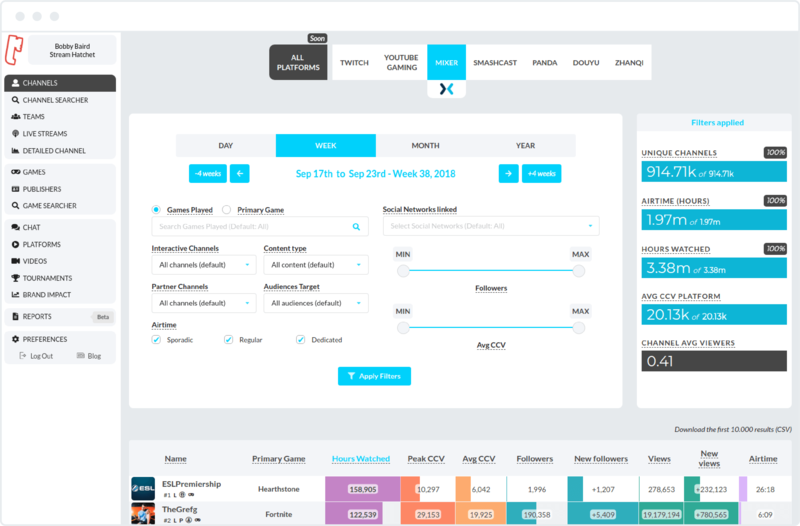 On top, you will find a full set of analytics and insights of any date range. 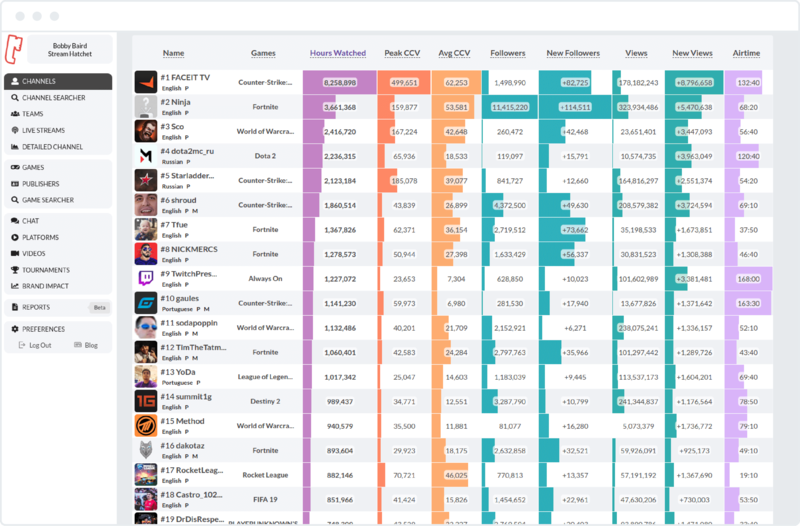 Monitor the most famous esports and influencers teams. You can also, create your team by adding the members you want to analyze. Evaluate the team members sorting by the column you want to analyze. 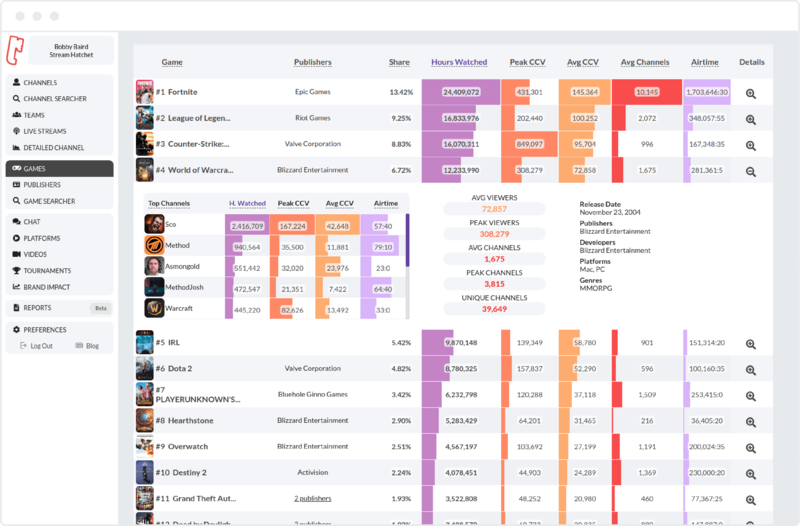 Search for different games applying filters such as Publishers, Game Genres, Platforms. Obtain the metrics data in any time frame you want. 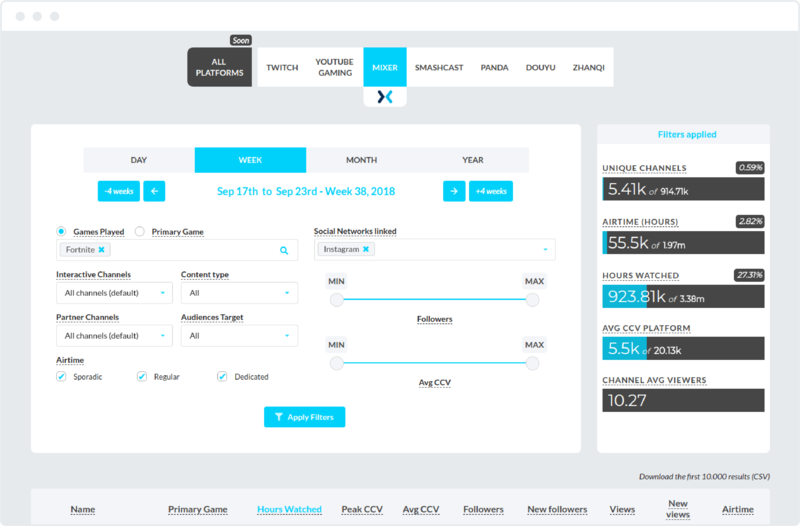 Analyze the metrics of the top 10 channels, the overall metrics of the game and also additional useful information about the game. 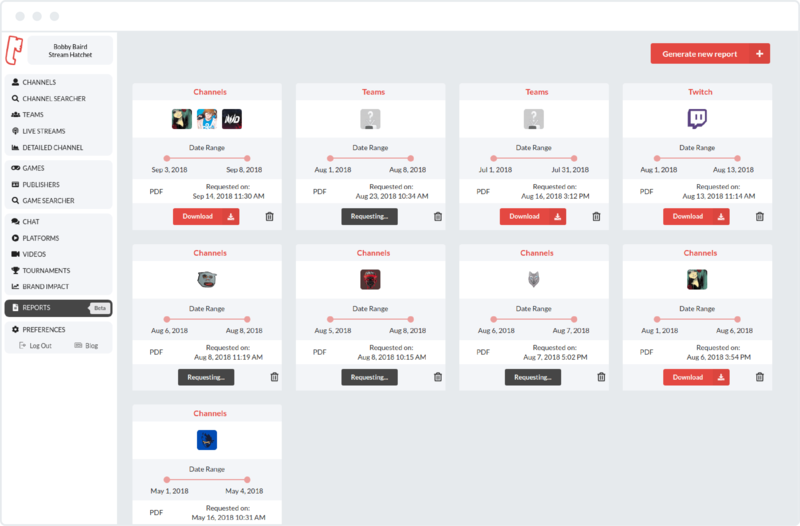 Get the metrics data and the most played games of each publisher using the calendar filter to select the time frame you desire. 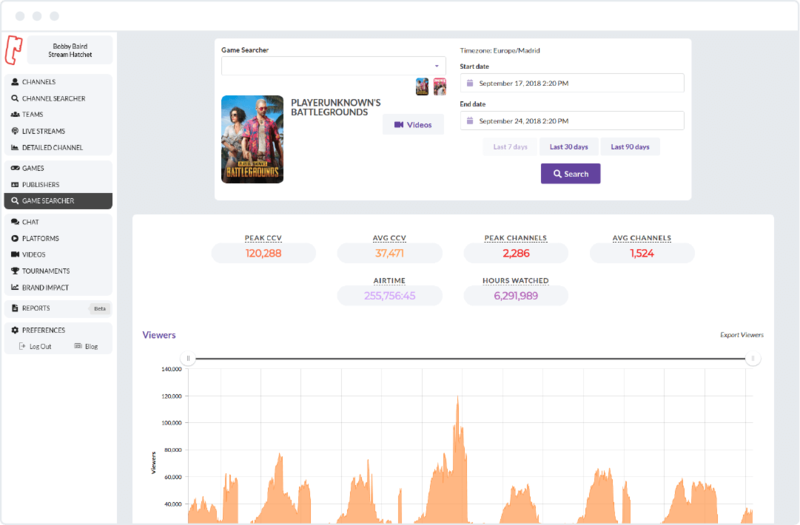 Analyze any game using the game viewership, the total number of streaming channels and game metrics such as the average concurrent viewers, average channels, hours watched. 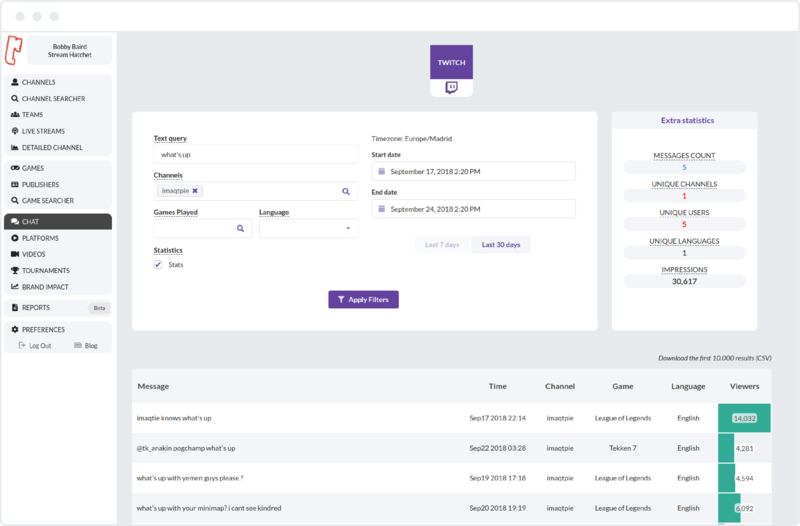 Search for chat messages by filtering the channels, games played and languages, e.g., Find during the last week the messages that contain "intel" in any stream, playing Overwatch and in English. 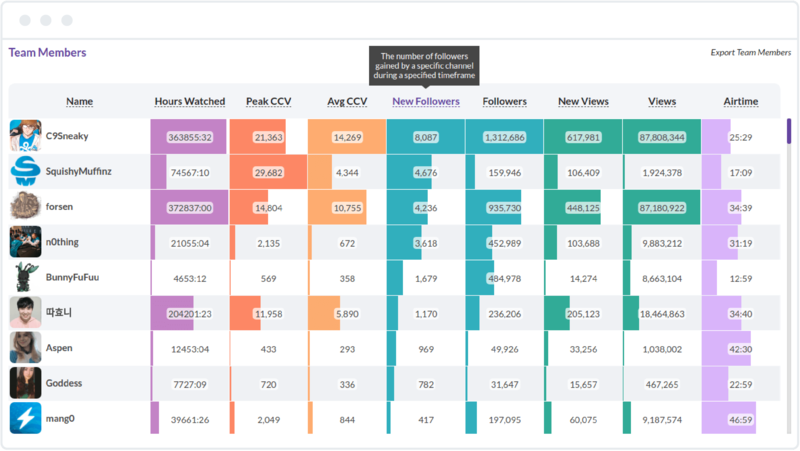 Analyze the KPIs of the different streaming platforms. Know which platform has more streaming channels or which one had the peakest concurrent viewers. That and much more here. The biggest esports tournaments here. 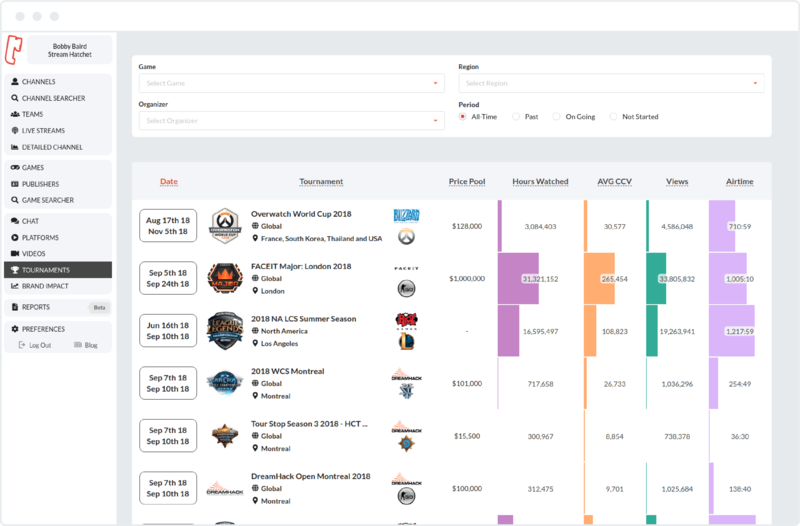 Compare esports tournaments stats like never before. Sort and filter them. Obtain curated stats of each tournament. Find any streaming stat of a tournament. 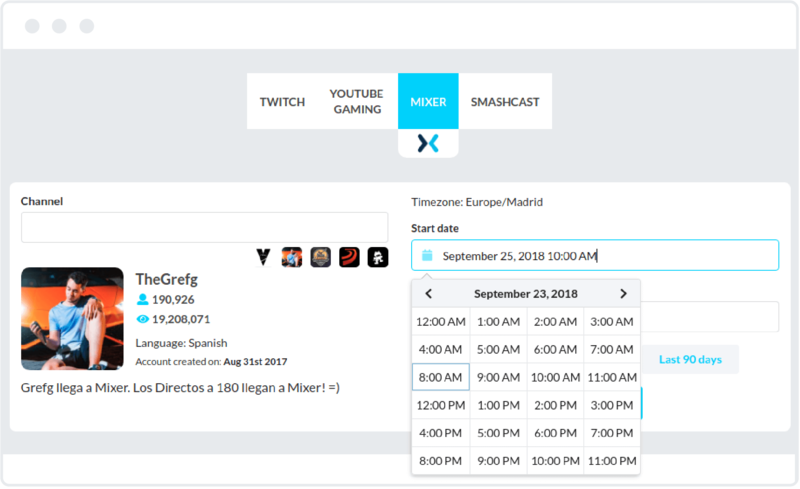 We manually select the channels from where the tournament was broadcasted. 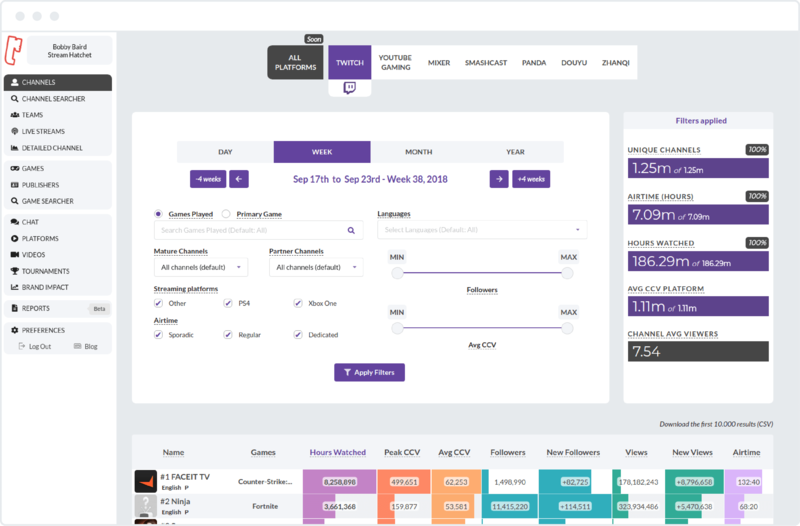 You will get stats per each channel as well as per phases. 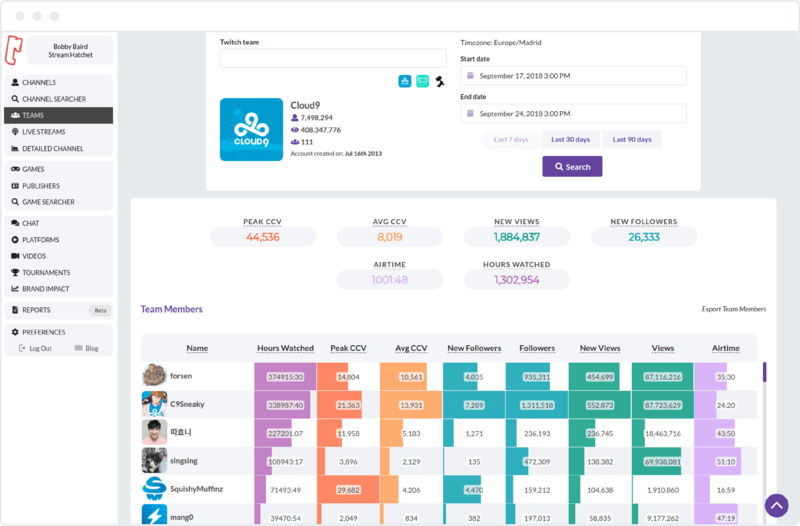 Brand impact data to provide context to the most successful brands on Twitch. 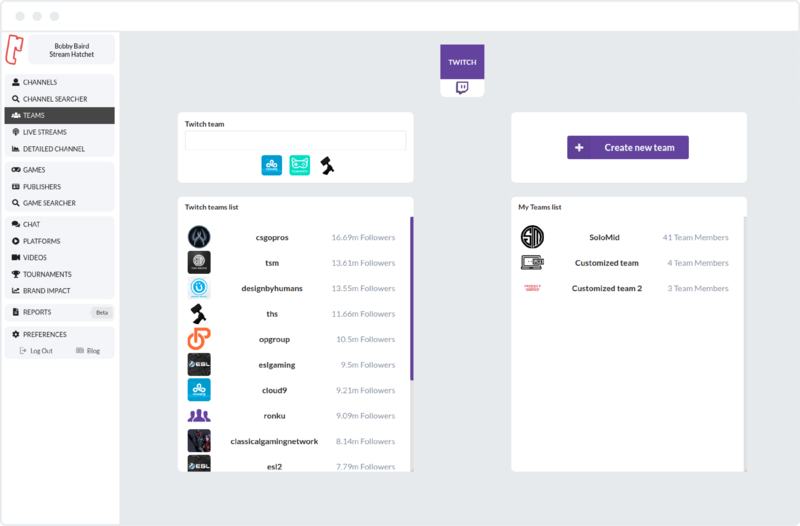 You can generate a report by channels, games, teams or platforms. 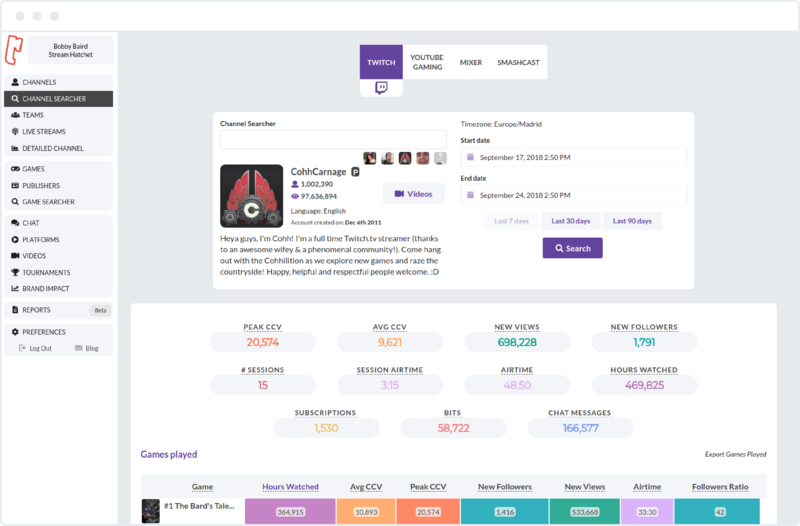 You can select a customized time frame and choose the analytics you want in the report, such as general stats, viewership graph, chat stats, subscriptions, games played and much more. 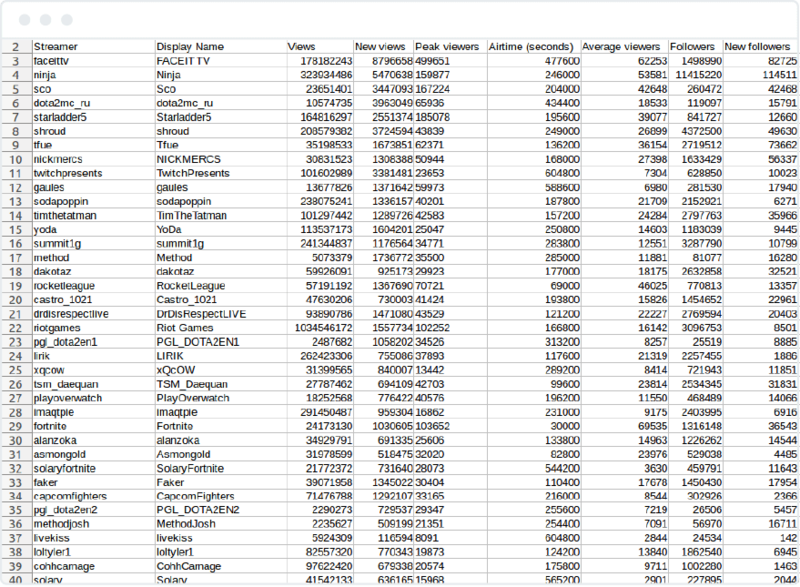 Much of the data on the website is exportable to a CSV file. Follow the KPIs to not get lost on the detailed data. Filter the data that you care about. Compare and quantfy differences. Frame the stats at your desired time frame. 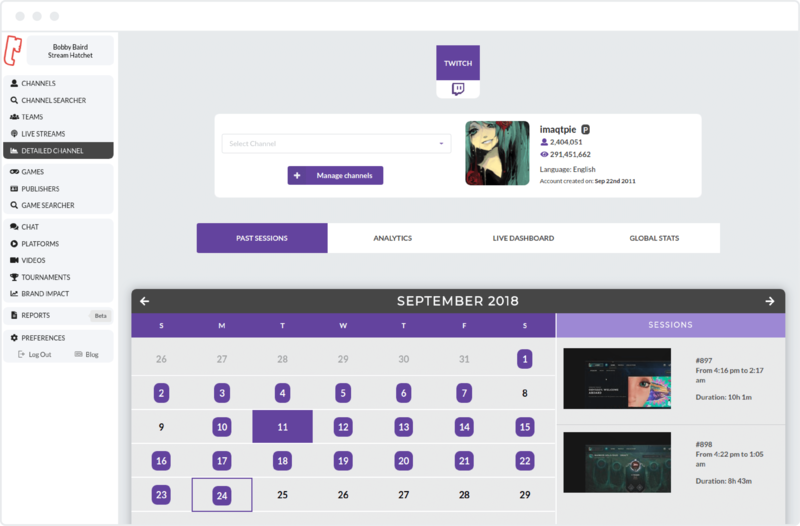 Stream Hatchet allows you to query any date range you want. Each platform and metric has its color to ingest the numbers better. When you see a table, you can sort it by any of its columns. It gives the ability to sort not only for the rows that you can see but for the entire list. Be aware, maybe the channel with the most airtime is not among the top channels by hours watched.